Give Thanks To God In All Circumstances, For God Is Good! In Bible, there are full of thanksgivings. The people of Israel had walked through the middle of the sea on dry ground, as the water stood up like a wall on both sides. That is how the Lord rescued Israel from the hand of the Egyptians that they pursued to kill the Israelites that day. However, God made the water rush back into its usual place. The Egyptians tried to escape, but the waters returned and covered all the chariots and charioteers—the entire army of Pharaoh. 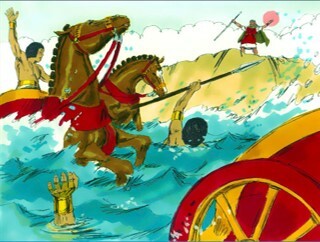 Of all the Egyptians who had chased the Israelites into the sea, not a single one survived. And the Israelites saw the bodies of the Egyptians washed up on the seashore. When the people of Israel saw the mighty power that the Lord had unleashed against the Egyptians, they were filled with awe before him. They put their faith in the Lord and gave thanks to God. This was the song of the Moses and the people of Israel on the other side of the Red Sea, while looking at the bodies of the mighty Egyptian warriors on the sea. The 600,000 men and their families (about two million people) sang the same song with the heart of thanksgiving to God, who rescued from the edges of the swords of the mighty Egyptian armies. Hannah was barren. She wanted to have a baby, but she could not. Her husband loved her and comforted her, but her heart was full of sorrows. Hannah prayed and prayed. One day, she was truly heartbreaking. She poured out her heart while looking up God. As she was praying, Eli, the priest watched her. Seeing her lips moving but hearing no sound, he thought she had been drinking. “Must you come here drunk?” he demanded. “Throw away your wine!” Even her priest could not understand her heart. Hannah was in extreme joy before God because God heard Hannah’s prayer. Hannah finally got a baby boy, Samuel. Her deep sorrow was comforted, and she was vindicated by God. She kept her vow to God. She gave her most precious Samuel back to God. In faith, she was in joy and gave the above prayer of thanksgiving to the God, who rescued and blessed her. God was her rock of faith, and she stood on the rock in thanksgiving. God made her joyful in her faith, and she sang back to God. David was the most beloved king by God. He was faithful in faith and God blessed. David captured Jerusalem, and David called it the City of David. He extended the city, starting at the supporting terraces and working inward. David became more and more powerful, because the Lord God of Heaven’s Armies was with him. When the Philistines heard that David had been anointed king of Israel, they mobilized all their forces to capture him. David prayed to God, and God granted His wisdom on David. David did what the Lord commanded, and he was able to strike down the Philistines all the way from Gibeon to Gezer. Then David again gathered all the elite troops in Israel, 30,000 in all. He led them to Baalah of Judaha to bring back the Ark of God, which bears the name of the Lord of Heaven’s Armies, who is enthroned between the cherubim. They placed the Ark of God on a new cart and brought it from Abinadab’s house. David and all the people of Israel were celebrating before the Lord, singing songs and playing all kinds of musical instruments—lyres, harps, tambourines, castanets, and cymbals. But when they arrived at the threshing floor of Nacon, the oxen stumbled, and Uzzah reached out his hand and steadied the Ark of God. Then the Lord’s anger was aroused against Uzzah, and God struck him dead because of this. So Uzzah died right there beside the Ark of God. David was afraid of the God, and he even asked, “How can I ever bring the Ark of the Lord back into my care?” David had to stop moving the Ark, although he badly wanted to move the Ark to Jerusalem. The Ark was at the house of Obed-edom, and God blessed the household because of the Ark of God. David prayed for three months, and then he decided to move the Ark to Jerusalem, the City of David with a great celebration. After the men who were carrying the Ark of the Lord had gone six steps, David sacrificed a bull and a fattened calf. And David danced before the Lord with all his might, wearing a priestly garment. 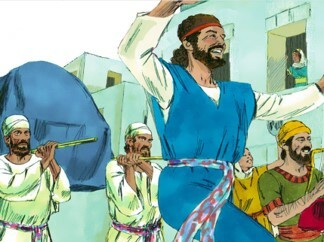 So David and all the people of Israel brought up the Ark of the Lord with shouts of joy and the blowing of rams’ horns. Finally, David brought the Ark of God in Jerusalem and set it in its place inside the special tent David had prepared for it. And David sacrificed burnt offerings and peace offerings to the Lord. When he had finished his sacrifices, David blessed the people in the name of the Lord of Heaven’s Armies. Then he gave to every Israelite man and woman in the crowd a loaf of bread, a cake of dates, and a cake of raisins. 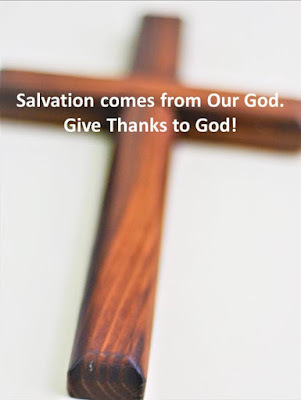 Cry out, “Save us, O God of our salvation! David was truly joyful because the Ark of God was in the city of David. He praised and gave thanks. He shared this thanksgiving with his people, and all sang together in the great joy. Then what will be the greatest joy for all believers? Here is the greatest scene that we, all believers, together will witness in Heaven and be joyful forever with all other believers before God. No more tears, deaths, sorrows, cries, and pains, and all things made new in Him. This is what we will experience in Heaven. Yes, we will together praise and giving thanks to God forever, who is our everlasting and ever-loving God. We will give our eternal thanksgiving to Him. Thus, we should not lose heart, fix our eyes on Jesus Christ, and run the race given to us while standing firm on faith in Him. This is our faith. God’s blessings to everyone who reads and shares this beautiful message with both believers and those to be saved in Jesus Christ, Our Savior. Faith -- Impossible? Believe and Be Victorious in Him! When Gideon was called by God, he was completely not prepared. He was hiding from the Midianites, the oppressor because he was in fear of them. 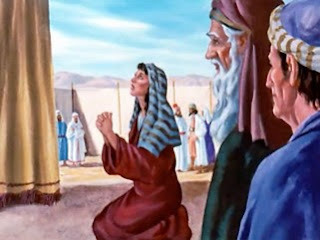 Upon realizing God’s calling, Gideon bravely acted upon God’s command by destroying the Baal’s alter and Asherah pole, but he did during the night. He was still in fear of the people of the town. However, God was pleased with Gideon, because he acted upon God’s command despite of the fear of the people. This is the lesson what we want to learn from Gideon. When we act upon God’s will, there is always an obstacle before us. For Gideon, the obstacle was the people around him – his own family members and the town people who still worshipped the Baal. Gideon knew his act would bring him harm. Yes, as expected, it happened. The people of the town, as soon as they figured out Gideon destroyed the Baal’s alter and Asherah pole next to it, came to Gideon to kill him. However, God protected Gideon from the hand of the angry mob. Instead, God made them convinced to wait for their false God to punish Gideon. Of course, nothing happened. Out of this event, many of the town people realized that the Baal was not a living god, but an idol made by their own hands, which could not do anything – including punishing Gideon. God always uses a brave act of His people in faith to glorify His name, and to expose the truth of the idols which are absolutely false gods. After all, our God is the One and Only living God, who always watches over His people because He loves His people as His own children. God was then came to Gideon again. For this time, Midian, Amalek, and the people of the east formed an alliance against Israel and crossed the Jordan, camping in the valley of Jezreel. The fear of the Israelites was much greater than before. All of them were in great fear. Gideon, of whom the Spirit of the LORD took possession, blew a ram’s horn as a call to arms, all of the men of the Israelites responded. Total 32,000 warriors came to Gideon to fight against the armies of Midian and their allies from the east side of the Jordan river. Gideon himself was surprised by the power of God. He was nothing but an ordinary person, but when he blew the ram’s horn, 32,000 warriors responded. He was completely taken by the God’s spirit, and in faith, he was about to attack the myriad of the enemies. Suddenly, God said to Gideon, “You have too many warriors with you.” Then God continued, “If I let all of you fight the Midianites, the Israelites will boast to me that they saved themselves by their own strength.” God gave a step-by-step instruction, “Therefore, tell the people, ‘Whoever is timid or afraid may leave this mountain and go home.’” Gideon faithfully obeyed God, and told what was given to Gideon by God. (Who would tell this type of message to the people gathered to fight? Gideon did in faith.) Upon hearing Gideon’s recommendation, to Gideon’s surprise 22,000 of them stood up and went home, leaving only 10,000 who continued willing to fight. He lost more than 2/3 of his warriors. His army was reduced down to 10,000 from 32,000. Even so, Gideon was calm before God. 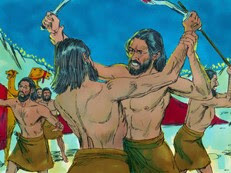 In faith, he was still ready to go out and fight with the 10,000 warriors against the myriads of the armies of Midian. Then God came again, and told, “Divide the men into two groups. In one group put all those who cup water in their hands and lap it up with their tongues like dogs. 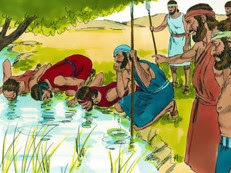 In the other group put all those who kneel down and drink with their mouths in the stream.” Per the God’s instruction, Gideon asked the 10,000 warriors to drink from the stream. Only 300 of the men drank from their hands. All the others got down on their knees and drank with their mouths in the stream. He sent the 9,700 warriors back home. He was only with the 300 warriors without kneeling down to drink from the stream. If we were Gideon, how would we feel at that moment? When we initially got the 32,000 warriors, which was in fact almost nothing when compared with the myriad of the enemies covered the entire valley. Even so, we believed God would give us a victory only with the 32,000 warriors, while looking at the 32,000 warriors. In other words, our eyes were still fixed on the 32,000 warriors, who were visible and looked strong, rather than God’s mighty hand, which was invisible. This was what God worried. Gideon was truly hurt. That night he could not sleep. In faith, he did everything that God asked, but he could not understand what God really wanted while thinking over God’s promise: “With these 300 men I will rescue you and give you victory over the Midianites.” In reality, it was absolutely impossible to fight against the myriad of the enemies with only 300 people. However, Gideon could not give up in faith. He struggled through the night. (This is the faith – clinging to God’s promise in faith although every sign in our lives points the other way around.) By the way, did God not know Gideon’s struggle? No, God exactly knew Gideon’s struggle in faith. God also knew exactly what Gideon needed at that time too. What Gideon needed was not additional warriors, but a stronger faith in Him. That night God came and said, “Get up! Go down into the Midianite camp, for I have given you victory over them! But if you are afraid to attack, go down to the camp with your servant Purah. Listen to what the Midianites are saying, and you will be greatly encouraged. Then you will be eager to attack.” Surely, God knew his struggle after losing 31,700 warriors that he initially believed God sent for him. God has never overlooked nor ignored our heart pains and struggles. God knows exactly how much painful, how much fearful, how much miserable, and how much helpless we are, and carefully watches over us. God feels our pains and struggles in His unfathomable love, as earthly parents are also equally painful while their children are struggling and in pain. When Gideon heard the dream and its interpretation, he bowed in worship before the God. Gideon realized that how much God loves him. Gideon got the exact answer. He was struggling and questioning why through the sleepless night. He realized that his struggle and question were groundless. 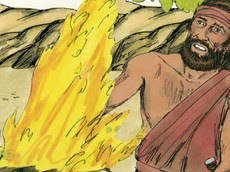 In fact, God had already prepared for His victory, and God was about to fulfill His victory through the hand of Gideon. Gideon was thrilled before the God’s awesome plan and His mighty act about to be unfold. 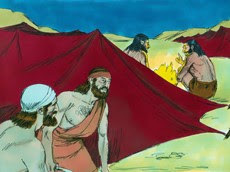 Then Gideon returned to the Israelite camp. While returning, he continuously prayed to God for His wisdom in the absolute faith in Him. As soon as Gideon arrived at the camp, he shouted, “Get up! For Our God has given you victory over the Midianite hordes!” In God’s wisdom, Gideon divided the 300 men into three groups and gave each man a ram’s horn and a clay jar with a torch in it. Please note that nobody took a sword. They just carried ram’s horns, clay jars, and torches in the jars. Yes, it was the Gideon’s battle plan through the wisdom of God in faith in God. When the 300 warriors heard the Gideon’s plan, nobody questions or argued against the plan. All 300 warriors quickly dropped their swords, and took ram’s horns, clay jars and torches in the jars! For Gideon, God touched on all of the 300 warriors, and made them one with Gideon: no sword in the same faith. Each man stood at his position around the camp and watched as all the Midianites rushed around in a panic, shouting as they ran to escape. When the 300 Israelites blew their rams’ horns, the God caused the warriors in the camp to fight against each other with their swords. Those who were not killed fled to places as far away as Beth-shittah near Zererah and to the border of Abel-meholah near Tabbath. Gideon and his 300 warriors defeated the myriad of the enemies who covered the entire valley like a swarm of locusts without a single swing of sword. After all, they had never carried any swords for the battle, but faith in God. God pleased with their absolute faith, and God gave them a huge victory. God fought for them, and the enemies fought against each other with their own swords, not the swords of Gideon and his 300 warriors, which they had never carried. Through faith and using the God’s wisdom, Gideon and his 300 faithful warriors were able to prevail over the well trained and well equipped myriad of the united enemies. God loved the faith of Gideon and the 300 warriors, and God gave them the huge victory. Faith is the key to fight against all our enemies, especially the most deadly one – the Satan. We often say we have faith. However, our eyes are still fixated on what we see and what we can touch. Surely, it is a lot easier to rely on what we see and can touch. If we rely on things that we see and can touch, then what are they? Without knowing, are we worshipping them to get our comfort, peace and security? It so, they are clearly idols. Thus, we need to ask before God: 32,000 warriors or the invisible God? 10,000 warriors or the invisible God? When our warriors are reduced down to 10,000, it is very tempting to put our eyes on these warriors although they are reduced from the original 32,000 warriors. Then what will God, who dearly loves us, do? God mercilessly reduces down to 300, which was 99.0626% reduction from the initial 32,000. How would be our reaction, if God reduces down something that we truly value to less than 1% of the initial size or amount? Yes, first, we will experience enormous pain in our heart. Does God not know our pain when we lose 99% of what we truly value in our lives? No, Our God know exactly how painful our hearts are. Then why does God cause such a pain? God told Gideon, “If I let all of you fight the Midianites, the Israelites will boast to me that they saved themselves by their own strength.” God truly loves us no matter what we do simply because we are His children. In fact, God, who madly loves us, has already prepared our victory before us. God truly wants for us to own His victory specially prepared for us, without being deceived by our own idols, the Baal, something that we truly value on earth, and even our own selves. All idols lead to separation from God and eventual destruction, but our faith in Him will make us grow deeper in Him while enjoying the relationship with Our True and Ever-Loving God. Our victory in Him is sure because God has already prepared for us. Let’s continue abounding in the work of God in faith with hope. Also give thanks to God, and praise His name for His mercy, grace and love in all circumstances! Like other the people of Israel, Gideon was in fear of the Midianites, who oppressed the Israelites for seven years. God let the Israelites suffer because they did evil before God by worshipping the idols: Baal and Asherah, instead of the true and living God. Finally, the people cried out to God, and God sent His angel to Gideon, not because Gideon was brave and more powerful than the rest of the Israelites. He was the least of his family, and his family was the weakest among the Israelites. God chose Gideon according to His good will to save the Israelites. God opened Gideon’s eyes, and Gideon realized that he met the angel of God, and He was called by God to rescue the Israelites. 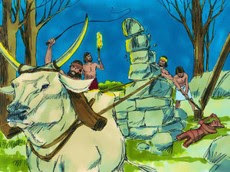 On the same night, God gave the first command to destroy the Baal’s alter and cut down the Asherah pole beside the alter. Gideon destroyed them as God commanded. However, Gideon did it during the night because he feared the people in the town and his family members. Even so, God pleased with Gideon. He did baby step in his faith although he was in fear. Yes, he was still in God’s work-in-progress. Soon afterward the armies of Midian, Amalek, and the people of the east formed an alliance against Israel and crossed the Jordan, camping in the valley of Jezreel. Then the Spirit of the LORD took possession of Gideon. 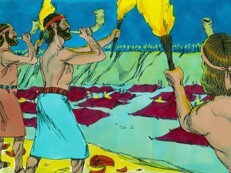 He blew a ram’s horn as a call to arms, and all of the men of the Israelites responded. Total 33,000 warriors came to Gideon to fight against the armies of Midian and their allies from the east side of the Jordan river. Gideons saw the power of God with his own eyes. 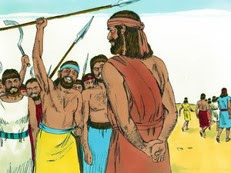 His clan is the weakest in the whole tribe of Manasseh, and he was the least in his entire family, but the entire Israel responded to his ram’s horn. The next step for Gideon was to lead them to fight against the armies of Median and the allies. But his heart was not ready. Thus, he came back to God, and authentically opened his heart to God. He asked His help to increase his faith. God, who was merciful, graciously answered his prayers by wetting a wool fleece while the surrounding area was dry, and drying a wool fleece while the surrounding area was wet. Gideon was truly encouraged by God. He immediately took the 33,000 warriors, and marched out to the spring of Harod. Yes, our God is always gracious and full of mercy. He has never rejected our prayer of His help to increase our faith. God answers. This our faith as He answered Gideon’s prayers before going out to fight against the armies of the Midianites and the allies, which were much bigger and stronger than his small army. The armies of Midian were camped north of them in the valley near the hill of Moreh. They filled the entire valley, and were as numerous as the sand on the seashore. Gideon and His worries were camped very close to where the armies of Midian to prepare their attack against the armies of Midian. It was a truly brave act to make up mind to fight against the enormous armies of Median and their allies. Suddenly, God said to Gideon, “You have too many warriors with you.” Initially, what he was told by God did not make sense at all. The 32,000 warriors of Israelites were absolutely not enough to fight against the armies of Midian and their allies, as numerous as the sand on the seashore. Gideon had been worrying about how to fight against the huge enemy with his only 32,000 warriors. He was completely baffled. 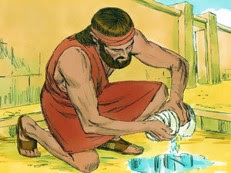 Then God explained the reason, “If I let all of you fight the Midianites, the Israelites will boast to me that they saved themselves by their own strength.” God’s real concern was not Gideon’s victory that God had already decided to give, but the Gideon’s prideful heart after he defeated the Midianites. A temptation to give a full credit to oneself is the most subtle and strongest. We love to give all credits to ourselves, not to God, although we know God has made us successful. God knew what Gideon and his warriors would be tempted. Thus, God cared for Gideon, and eliminated the temptation. God must have had really loved Gideon. God gave a step-by-step instruction, “Therefore, tell the people, ‘Whoever is timid or afraid may leave this mountain and go home.’” Gideon faithfully obeyed God, and told what was given to Gideon by God. Upon hearing Gideon’s recommendation, to Gideon’s surprise 22,000 of them stood up and went home, leaving only 10,000 who continued willing to fight. He lost more than 2/3 of his warriors. His army was reduced down to 10,000 from 32,000. Gideon could not believe what had happened. He thought that most of them were brave and would be with him no matter what happened. He was truly disappointed with those who went home. His heart was in panic, but Gideon remembered the signs that God gave to him using a wool fleece. In faith, Gideon struggled to overcome by making every effort to continue believing God and His goodness. After all, he did not lose his faith after losing 22,000 warriors. Let’s question to ourselves, if we lose 2/3 of what we have, what’s would be our response? Calm like Gideon or panic like a scared rabbit? Gideon was able to be calm with the 10,000 warriors. In faith, he was about to go out and fight with the 10,000 warriors against the myriads of the armies of Midian. Gideon still had 10,000, and God was with him. He believed that he would win the battle in God’s power. He started making a new attack plan for the reminded 10,000 warriors because the original attack plan would no longer work. It was designed for the 32,000 warriors. It was painful to make a new plan with only 10,000 warriors. It was almost impossible to win the battle. Even so, he was obediently working on the new plan to attack the armies of Midian with the 10,000 warriors. 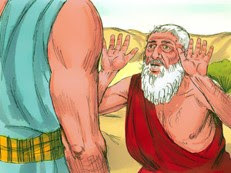 While Gideon was working on the new battle plan, again God came to Gideon, and told, “There are still too many!” What? 10,000 warrior vs the armies of Midian and their allies, who covered the entire valley. Upon hearing, Gideon immediately stopped working on the new battle plan. By that time, Gideon was a truly obedient man. He waited for God’s next command. God continued, “Bring them down to the spring, and I will test them to determine who will go with you and who will not.” For this time, God did not give any specifics. God just told Gideon: “Do what I say.” This was another opportunity to make Gideon’s faith stronger in God. Gideon obediently took the 10,000 warriors down to the water. (Gideon’s obedience in faith pleased God.) God again told Gideon, “Divide the men into two groups. In one group put all those who cup water in their hands and lap it up with their tongues like dogs. In the other group put all those who kneel down and drink with their mouths in the stream.” Per God’s instruction, Gideon asked the 10,000 warriors to drink from the stream. Only 300 of the men drank from their hands. All the others got down on their knees and drank with their mouths in the stream. God told Gideon, “With these 300 men I will rescue you and give you victory over the Midianites. Send all the others home.” It was almost unreal. Gideon was ended up to get only 300 warriors out of 32,000 warriors. This was less than 1% of the warriors originally responded to Gideon’s ram horn (exactly, 0.9375%). Gideon, although he was strong in faith, became nervous. How could he fight against the armies of Midian and their allies? It was so obvious that it was absolutely impossible to fight and defeat the countlessly many armies of Midian and their allies. Even so, in faith, Gideon obediently sent the 9,700 warriors home. He did it in faith in God. Gideon’s faith grew tremendously. He was hiding from the Midianites and threshing in the winepress. Then he did follow God’s command to destroy the Baal’s alter. However, he could not do in daytime, but did it during the night because of his fear of the people and his family. Even so, God pleased with his baby stepping faith. Then God sent God’s Spirit to took possession of Gideon. Gideon blew a ram’s horn, and 32,000 warriors responded. Gideon, then, bravely took the 32,000 warriors to fight against the huge armies of Midian and their allies covered the entire valley. 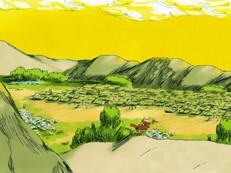 Gideon and his warriors were encamped near the enemies. Unexpectedly, God asked to send away 22,000 warriors. Gideon did. Only 10,000 warriors were with Gideon. Then God asked again to send away 9,700 warriors. Gideon also did. Gideon was ended up with only 300 warriors. Then it was literally impossible to fight and defeat the countlessly numerous armies of Midian and the allies. Even so, Gideon was ready to fight against the countlessly many armies of Midian and the allies. It was the Gideon’s faith. God transformed Gideon to one of the most faithful in Bible. He experienced and believed God. Once Gideon met God, he continuously grew into faith in God. When he authentically prayed to God for God’s help, God answered. God helped Gideon when he was weak in his faith. Here is the pattern what Gideon did. Listen to God, pray to God, and do God’s will. Yes, we might not be perfect before God because we are still in fear of the world, but God pleases with us not because we are perfect, but because we did what God commanded despite of our fear and doubt. Therefore, whenever we need His help, just put out our heart, whether it is our fear, pain, sickness, uncertainty of future, a severe financial problem. God hears us. God is always faithful to us, and God wants for us to have a deeper relationship with Him. This is how to grow in faith in God. Baby stepping in our faith is a just first step, then keep listening, praying and doing what God wants. This pleases God, and we grow in faith in Him. Please remember God always loves us only because we are His beloved children and He is our ever-loving Father.